Lacye and Marshall (Bubba) met each other working together in the hospital and were smitten right away. With only around 20 guests, it has been the smallest wedding I've ever done in the jaw-dropping, beautiful Hacienda Siesta Alegre. My day started as it always does, with the bride getting ready. The cool part of this is that everyone there with Lacye was either a daughter or granddaughter; the same with Bubba. They wanted a first look session, because after the wedding it would be just them spending time with their family. Right at their first look, it became evident to me that Bubba and Lacye are head over heels with each other. And they were so comfortable expressing their love and excitement, that I didn't even have to peep from far away with the camera. They didn't care I was there. After the first look, we walked around the hacienda for their gorgeous couple portraits until the Ceremony was about to start. During the ceremony, they kept their tenderness and attentiveness to each other. It was such a romantic event! After the Ceremony, we all joined in for group photos. My favorite one being L&B with all the grandchildren. There were just so many. It was amusing and challenging at the same time getting their attention so they would all look to the camera. This same casual, happy and relaxed atmosphere permeated through the complete day. 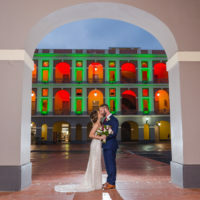 Lacye and Bubba were sneaking out of their wedding so they could enjoy some time together walking around the hacienda. I can't describe how beautiful and meaningful this wedding was. Weddings usually mark the beginning of a family. But to Lacye and Bubba being a mature couple, they were there not only celebrating their union, but the beautiful families they had already built on their own, and that now were brought together as one. Everywhere you looked, a toddler was running and exploring the world. Siblings were finally enjoying some time together after being apart for so long. The purest celebration of family, and the true essence of a wedding, if you ask me. We finished the night with some heavy rain -and heavy dancing- on the dancefloor. And before I left, they did a sparkler exit. It was enjoyable and the perfect ending to such an ideal day.